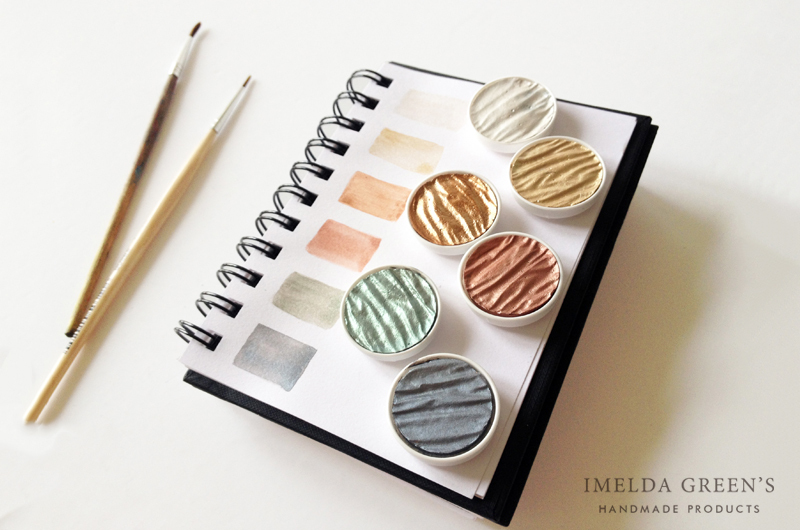 It’s been a while since the New Medium series was present on the blog, but a few weeks ago I laid my hands on something interesting: I met the Finetec Pearlcolors paints on Youtube first and immediately concluded that it would probably be years before I can buy them in Hungary. Next thing I knew, I found them in a Hungarian webshop for art supplies. Technically speaking, Pearlcolorsis not watercolour paint, as it’s opaque, its texture is much more like gouache, when used on paper. The more water you use, the more transparent they become, but when used thickly, it completely covers the layers under it. Since watercolours are basically transparent (all layers under are visible even after drying), you cannot use them on black paper. Pearlcolors, however, looks radient on dark paper. Perhaps even better than on white. 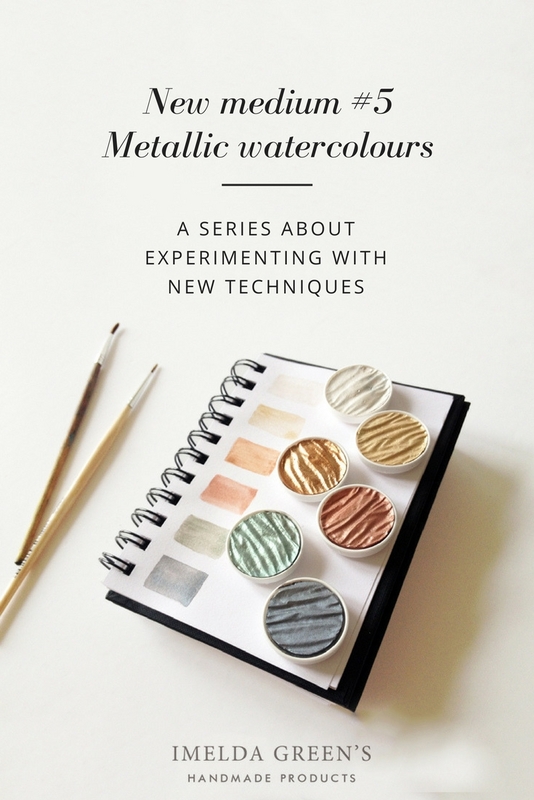 Even though they look beautiful on their own, Pearlcolors paints can be mixed with regular watercolours nicely, which will give a metallic glow to any colour on your old palette (hence my puzzlement of Finetec producing so many colours). I generally like to pre-draw my paintings and erase my sketches after the painting is complete. I had had some backthoughts about this in the case of metallic paint, but it was a pleasant surprise to find that after erasing my sketches, no gold remained on my eraser and the painting was just as brightly gold as before. Pearlcolors can be bought in various webshops, here I’m linking the producers, Coliro. 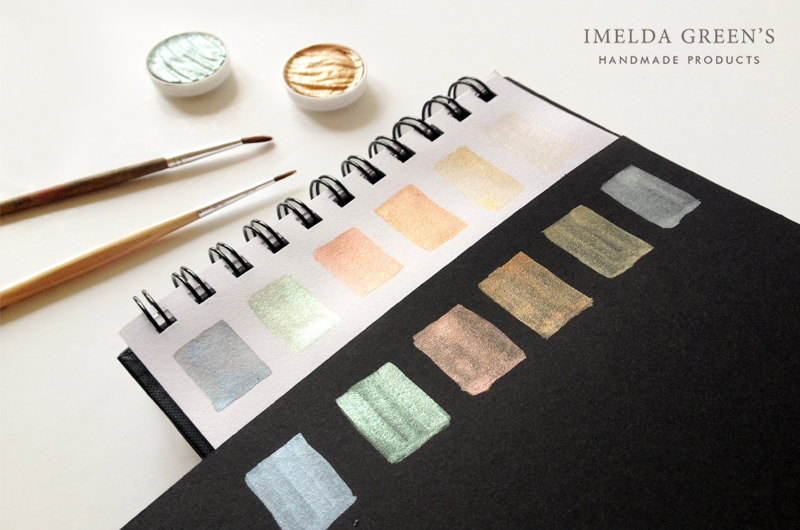 These metallic paints don’t come cheap, but the nice thing about them is that you can buy it in different colour sets, or choose colours according to your liking. I actually think they are worth their price because you get them in compact form rather than liquid, so they don’t go off or dry out. 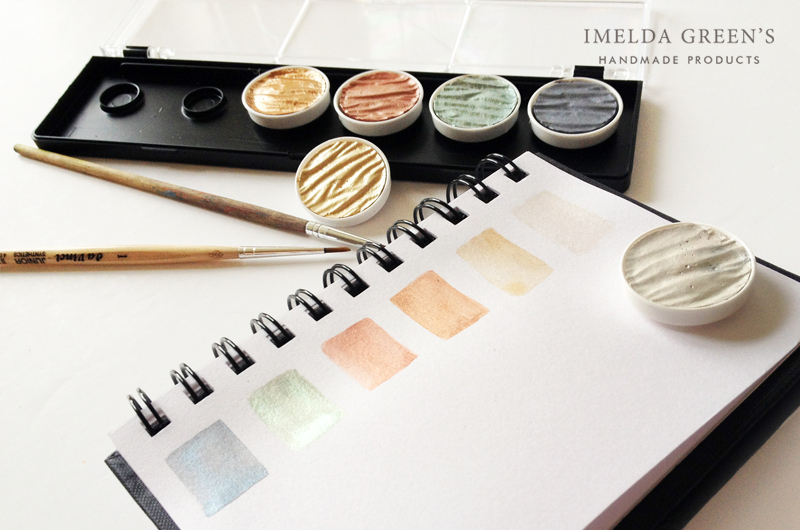 It takes about the same time for Pearlcolors to dry as regular watercolour, it could be 2-7 minutes depending on the amount of water you use. Painting with metallic paints alone is definitely too much for my taste, and it took me a little while to figure out how I wanted to use this beautiful palette. The great brain wrecking led back to the original route: I used it for calligraphy. At the same time it looks great if you want to highlight a few points, for example the pistils on this picture. It is tempting to use all colours when you get a beautiful palette like this, but in my case they will probably last a life-time: I think they weaken, rather than enhance each other when used in excessive quantities. 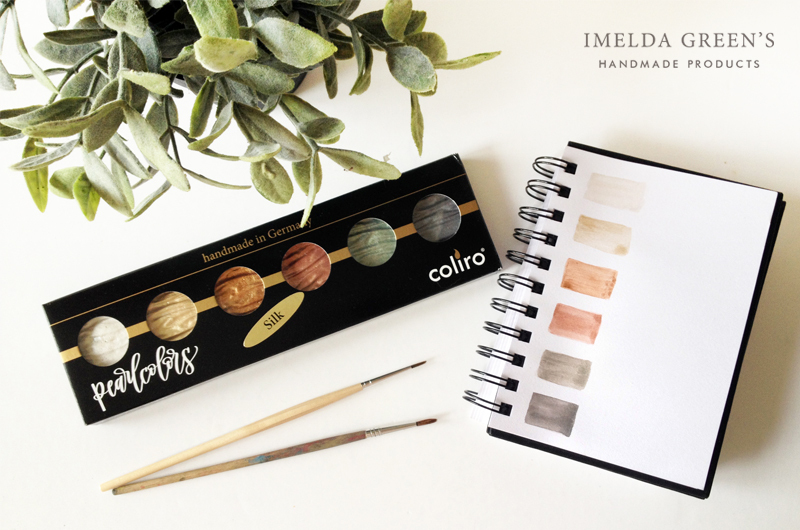 Apart from calligraphy, I am planning to use Pearlcolors on some space-y topic, but if you have other ideas on how to use this palette, don’t hesitate to share them in the comments below. Have you tried Pearlcolors? What were your experiences?